Hey there! 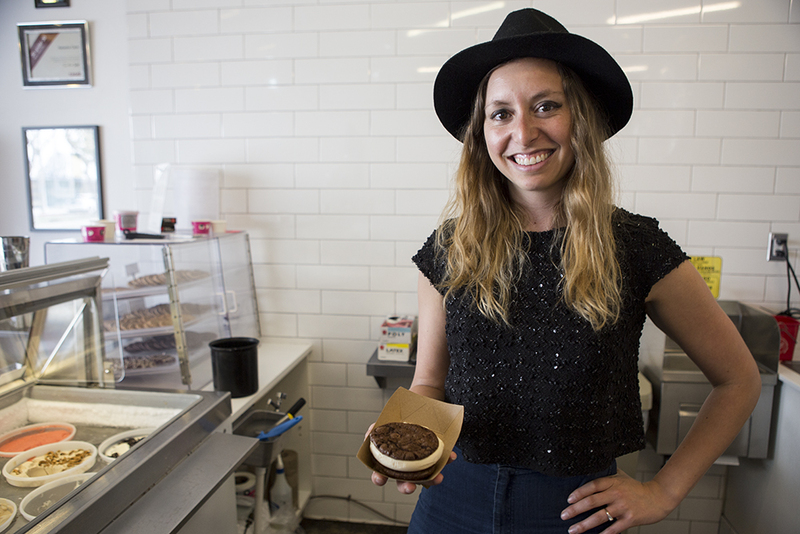 I'm Natasha Case, CEO and co-founder of Coolhaus. Coolhaus is an architecturally-inspired, gourmet dessert company made famous for its scooped-to-order ice cream sandwiches and unique, mouth-watering flavor combinations (think Maple Flapjack cookies with Fried Chicken & Waffles ice cream). Coolhaus operates a national fleet of 12 mobile ice cream trucks and carts (5 in Southern California, 3 in NYC, 2 in Austin, and 2 in Dallas) and two brick and mortars in LA (Culver City & Old Town Pasadena). Coolhaus sandwiches, pints and bars are available at 2000+ gourmet markets across the US. The idea for Coolhaus was born when my co-founder, Freya Estreller, and I were making cookies and ice cream into 'cool houses' and wanting to build awareness about architecture and design through food and punny names. With our similar passions for food and architecture, Coolhaus was born. Before our discovery of Boomerang, we experienced some growing pains that were primarily due to limitations within email and simply not having enough hours in the day. I'm a busy boss lady! Sometimes I don't get to correspondence until 11pm, midnight or even later. Of course, I don't want to be responsible for interrupting anybody's sleep, and because I'm in LA and some of my team is in NY this time frame can be especially undesirable for emailing. On top of my night owl tendencies and crazy work schedule, our team also works with a lot of leads who are looking for seasonal deals or may only have certain periods to introduce our Coolhaus to their markets. It can be nearly impossible to remember to follow up at the right time which could result in a loss of valuable sales for our growing company. There were some programs out there that helped resolve some of these troubles. We ran into some problems when they were not integrated with our current solution, were too expensive, or did not work as advertised. Boomerang really came in and saved the day by working well at a reasonable price and best of all, it didn't require learning a new program because it integrates so nicely with our Google Apps email. We love Google and I think it's safe to say our business would not be what it is today (or gasp! may not exist) without the services they offer. Our team uses Google Apps to manage our email and calendars and many of the people on the Coolhaus team rely on the integrated system Google Apps has built to get work done more efficiently. We started using Boomerang because it adds some of the exact functionality to Google Apps email that we were searching for. Boomerang is an all-in-one solution to that helps our team excel at email and scheduling. If you're not familiar with the features, some of my favorites are Send Later, Boomerang, and follow up reminders - keep reading for details on each. One thing I loved from the get-go was how only users who would really benefit from the features are on the paid plan, unlike many other services which are company-wide all or nothing type deals. I have over 70 employees now, however the vast majority of them aren't experiencing the same email load and limitations that I have. They may use Boomerang only a couple times per month. For those users, Boomerang is 100% free! How great is that. For the rest of my team who is living out of their inbox, we couldn't ask for a better solution. Boomerang has truly been a game-changer for me, my career, and our team. Not only does it allow us to be extremely thorough and organized with follow-up, but also provides seamless integration with Google Apps email for scheduling messages and creating priority structure in our inboxes. Boomerang has become my secret weapon that makes people wonder how I get so much done and appear so on top of everything. I can't imagine email without the features Boomerang provides. Previously, I mentioned that I may not get to email until pretty late and with the Send Later feature, Boomerang allows me to schedule my correspondences to appear in the recipients inbox RIGHT at the moment desired or strategized, or even in some cases make it appear as if I am living in all of our cities (LA - Pacific time, Austin/Dallas - Central time, NYC - Eastern time) at once! Pretty magical, right. Boomerang has become essential to our team's workflow in ways that are positively impacting our business and growth as a company. We have been able to stay on top of our follow-up in terms of booking events and converting sales. We have seen staggering growth as a company since we launched in 2009 and the combined time saved from Boomerang by not searching for messages that have fallen through the cracks is easily hundreds of hours. The Boomerang feature allows us to quickly prioritize our work day in terms of what correspondence is critical and needs to be completed immediately and what correspondence can be held for a later date. I like to keep my inbox clean of items that are not relevant. If I have a message that I don't need until a meeting next week, I just Boomerang it until the day or even hour before rather than letting it fester and take up unnecessary space in my inbox. As a team, we work with a lot of really busy people who are balancing a lot on their plates. It is not uncommon for replies to take a while or be forgotten completely. Luckily, this is no longer an issue because - you guessed it - Boomerang has a feature to help with this problem. When you're composing a message, you can select for the message to Boomerang back only if nobody replies and that's one less thing you have to write down or remember. This feature especially useful for our sales team in particular. Not worrying about EVER dropping the ball because of this magical feature has made a big difference. We're not in the business of nagging our partners, but sometimes a gentle follow-up nudge will help deals close quicker and more smoothly. Plus, it tells our leads that we are interested and serious and has helped us get our treats into stores closer to you. This feature is also great for obtaining the details we need to execute events and orders properly and smoothly with clients and retailers. We love Boomerang so much we even created a nickname we use internally. Boom! I have recommended Boomerang with Google Apps to countless colleagues and friends. It has become essential to our operation and work style. There is no reason I can think of not to use Boomerang and Google Apps and I'm sure my team would agree. "Boomerang has truly been a game-changer for me, my career, and our team. Not only does it allow you to be extremely thorough and organized with follow-up, but also provides seamless integration with Google Apps email for scheduling messages and creating priority structure in your inbox. I have recommended Boomerang with Google Apps to countless colleagues and friends. It has become essential to our operation and work style." " I can schedule my correspondences to appear in the recipients inbox RIGHT at the moment desired/strategized, or even in some cases make it appear as if I am living in all of our cities (LA - Pacific time, Austin/Dallas (Central time), NYC - Easter time) at once!"